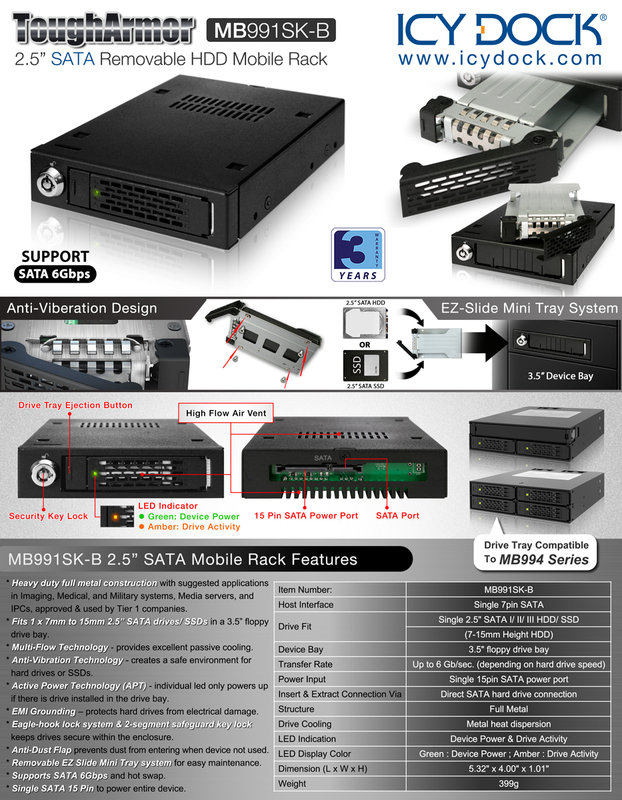 Introducing the Icy Dock ToughArmor MB991SK-B 2.5″ SATA Mobile Rack solution for use in 3.5″ device bays (Floppy bay). It is a smaller form factor device built specifically for systems with small real estate to work with. Using a heavy duty metal construction, it is capable to withstand the harshest enterprise type environments. The drive is fully secured by our proven technologies such as, the Eagle-Hook lock system and metal 2-segment safeguard key. Our full metal EZ Slide Mini Tray allows interchangeability of data between multiple systems with other ToughArmor products. Suggested applications in Medical & Military systems, Media servers, and IPCs, approved by Tier 1 companies.